When you look at a group of puppies, they each have the same adorable little face that just about screams out to be touched. 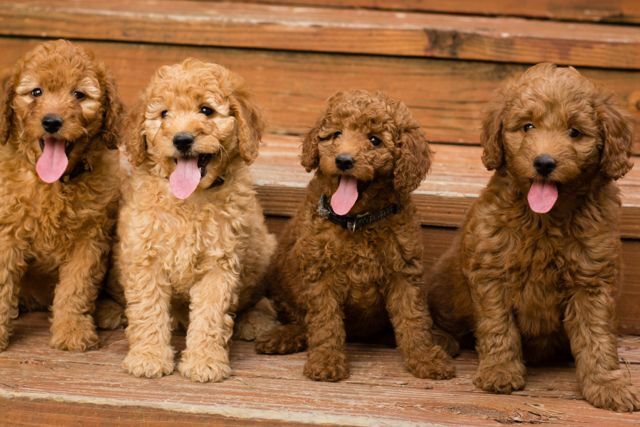 Even if the puppies all look the same to our eyes, they are very different individuals. How can you know what a puppy will be like when he is older? First, it is important to try and get an idea of what that puppy will develop into. This helps make sure that a puppy is best paired up with a person of the same personality. For example, if you want a champion obedience competitor, you aren’t going to want the puppy that prefers to hang back by himself quietly entertaining himself. 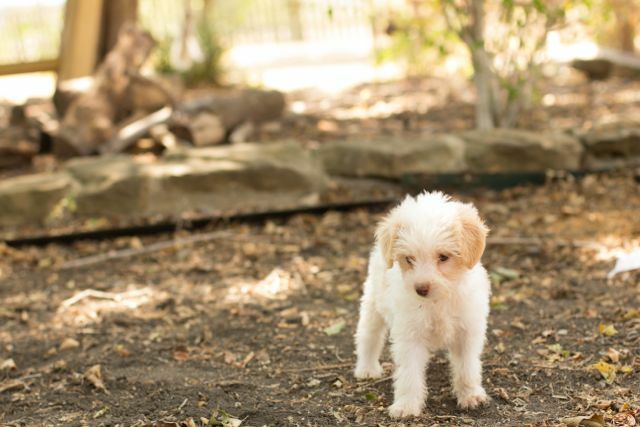 Instead, you’re going to want to select an outgoing puppy that is eager to please and wants to interact with you. Temperament testing doesn’t just pick out a competitive sport dog. It also helps select the best puppy for a family with children, a young couple with other pets, or an active single person. Testing matches a puppy’s personality, energy level, and needs with the appropriate family and home. A puppy is made up of two things: his genes and the environment that helps shape him. His basic intrinsic self is formed up of genes, and his personality will largely be formed by these genes. Whether he will be shy, independent, curious, outgoing, boisterous, etc. is pre-determined by his genetic makeup. The environment will help shape the puppy into the best adult dog he can be. For example, if a puppy is pre-determined to be a tad shy, the environment can help him learn to become more curious and self confident. The environment doesn’t change the basic nature of the dog, but it enhances what the puppy is given, genetically speaking. According to Dr. Carmen Battaglia, AKC Judge and dog enthusiast, a study investigating the speed and performance of related race horses found that a horse’s performance wasn’t solely up to his genes. In fact, researchers determined that only about 35% of a horse’s performance ability was inherited, and the remaining 65% was determined by the nutrition, training, and environment. While this is a study about horses and speed, the results can correlate into puppy rearing, allowing us the opportunity to enhance a puppy to his fullest potential. When a puppy is only a few days to weeks old, we can’t know what the puppy will be like. He isn’t formed yet. Many breeders, service dog organizations, military and working groups use this formative time to teach a puppy to better handle stress. The Super Dog/Puppy method is one way of adding a small amount of neurological stress to a puppy (Early Neurological Stimulation). Things like holding the puppy in a particular position or touching him a particular way are introduced in order to stimulate the puppy’s neurological system. It is thought that this early introduction can help a puppy later be more comfortable in times of stress and better able to cope. “In tests of learning, stimulated pups were found to be more active and were more exploratory than their non- stimulated littermates over which they were dominant in competitive situations,” says Dr. Battaglia. Once a puppy reaches the ripe old age of 7 weeks, a more official type of temperament test can be completed. The most commonly used system is the Volhard Temperament Test or Puppy Aptitude Test. It should be conducted at 7 weeks of age in a location that is unfamiliar to the puppies and by someone the puppies are unfamiliar with. Why 7 weeks of age? Puppies are like a blank slate at this age, and true learning hasn’t begun to occur. In the weeks to come, life experiences will shape how a puppy responds, so it is far more likely that a puppy at 7 weeks won’t be the same as if he were tested at 10 weeks old. Puppies are tested individually so that an evaluator can see how a puppy reacts without a support system around. With a known person or a group of puppies to back him up, a puppy may react very differently. For the test to be effective, you want the puppy to be operating on his own thoughts. A temperament test such as this helps determine particular personality traits in a puppy. There are a series of things that are tested, such as how willing a puppy is to follow a thrown item or to follow a person. Then a puppy is rated 1-6 on each task based on a certain criteria for each task. At the end of the task, the evaluator looks to see how many of each number a puppy has. The more 1s and 2s a puppy has, the more challenging a dog he will be. These puppies are better suited to experienced homes. Puppies that are 5s and 6s can also be challenging, but in a different way as these puppies make be shy or reluctant to engage in activities or very independent natured. 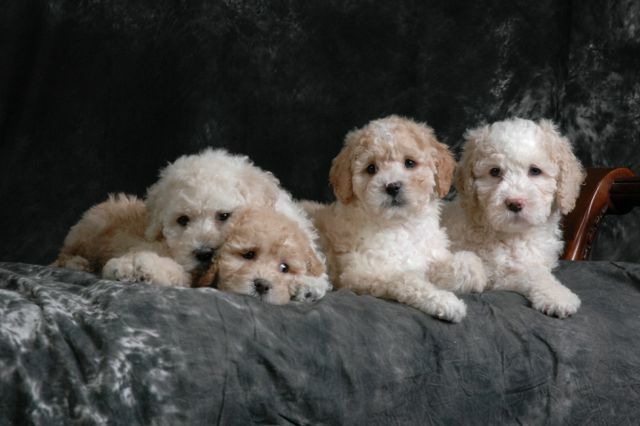 The majority of homes will be best suited with 3s and 4s or middle of the group puppies. Another type of temperament test is the CARAT test (Clothier Animal Response Assessment Tool), which was developed by Suzanne Clothier. This temperament testing system looks closely at each individual and that puppy’s behavior. Behavior is viewed as functional, adaptive, or not. Behavior is not lumped into broad generalizations. A mid-scoring dog in these tests is one that proves to be both functional and adaptive. Because this test is more in-depth, many service dog groups have begun using it to help better determine which puppies will potentially make more ideal service dogs. Guiding Eyes for the Blind has been using CARAT testing since 2007. Any type of temperament test is most effective when used on a pedigree line that a breeder knows very well and that is true to form. A puppy’s brain is not fully formed or developed at 7 weeks of age, and it is very possible for a puppy to score well on a temperament test and then change. Why? Because a puppy at about 4 months of age begins to develop more of his adult brain, and genetic traits become more obvious beginning at this age and beyond. Traits like shyness and aggression become more apparent. It is possible to have a 7 week old puppy test very well on the test, but become shyer as he ages, if he has a genetic predisposition for shyness. This is why temperament test scores should always be measured against a known pedigree. When compared with a known pedigree (and when a breeder knows what weaknesses there may be in a pedigree), a temperament test can be one effective way of helping to pair a puppy up with the right family. 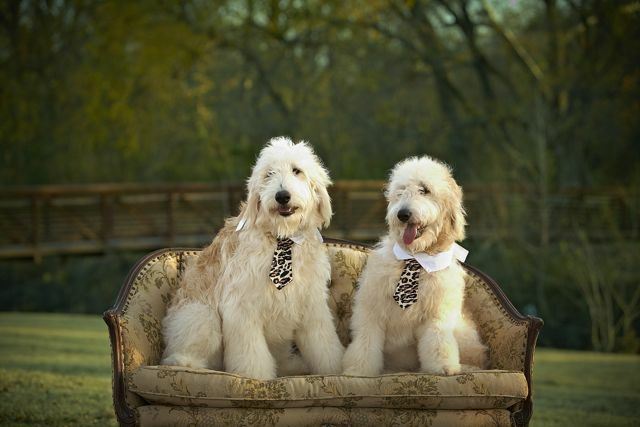 Watch a video of a Safari Doodle puppy in a Volhard Temperament Test. The Volhard score sheet and instructions are shown below the video. Place the puppy in test area. From a few feet away the tester coaxes the pup to her/him by clapping hands gently and kneeling down. Tester must coax in a direction away from the point where it entered the testing area. PURPOSE: Degree of social attraction, confidence or dependence. Degree of social attraction, confidence or dependence. 2. Came readily, tail up, pawed, liked at hands. 3. Came readily, tail up. 4. Came readily, tail down. 5. Came hesitantly, tail down. 6. Did not come at all. Stand up and walk away from the pup in a normal manner. Make sure the pup sees you walk away. PURPOSE: Degree of following attraction. Not following indicates independence. 1. Followed readily, tail up, got underfoot, bit at feet. 2. Followed readily, tail up, got underfoot. 3. Followed readily, tail up. 4. Followed readily, tail down. 5. Followed hesitantly, tail down. 6. No following, or went away. Crouch down and gently roll the pup on his back and hold it with one hand for a full 30 seconds. PURPOSE: Degree of dominant or submissive tendency. How it accepts stress when socially and/or physically dominated. 1. Struggled fiercely, flailed, bit. 3. Settled, struggled, settled with some eye contact. 6. No struggle, straining to avoid eye contact. Let pup stand up and gently stroke him from the head to back while you crouch beside him. Continue stroking until a recognizable behavior is established. PURPOSE: Degree of acceptance of social dominance pup may try to dominate by jumping and nipping or it is independent and walks away. 1. Jumped, pawed, bit growled. 3. Cuddles up to tester and tries to lick face. 4. Squirmed, licked at hands. 5. Rolled over, licked at hands. 6. Went away and stayed away. Bend over and cradle the pup under its belly, fingers interlaced, palms up and elevate just off the ground. Hold it there for 30 seconds. 1. Struggled fiercely, bit growled. 5. No struggled, licked at hands. Crouch beside pup and attract its attention with crumpled up paper ball. When the pup shows interest and is watching, toss the object 1 to 2 meters in front of pup. PURPOSE: Degree of willingness to work with a human. High correlation between ability to retrieve and successful guide dogs, obedience dogs, field trial dogs. 1. Chases object, picks up object and runs away. 2. Chases object, stands over object, does not return. 3. Chases object and returns with object to tester. 4. Chases object and returns without object to tester. 5. Starts to chase object, loses interest. 6. Does not chase object. Take puppy’s webbing of one front foot and press between finger and thumb lightly, then more firmly till you get a response, while you count slowly to 10. Stop as soon as puppy pulls away or shows discomfort. PURPOSE: Degree of sensitivity to touch. 1. 8 – 10 seconds before response. 2. 6 – 7 seconds before response. 3. 5 – 6 seconds before response. 4. 3- 4 seconds before response. 5. 1 – 2 seconds before response. Place pup in centre of area. Tester of assistant makes a sharp noise a few feet from the puppy. A large metal spoon struck sharply on a metal pan twice works well. PURPOSE: Degree of sensitivity to sound (also a rudimentary test for deafness). 1. Listens, locates sound, walks towards it barking. 2. Listens, locates sound, barks. 3. Listens, locates sound, and walks there curiously. 5. Cringes, backs off, hides. 6. Ignores sound, shows no curiosity. Place pup in centre of room. Tie a string around a large towel and jerk it across the floor a few feet away from the puppy. 1. Looks, attacks and bites. 2. Looks, barks and tail up. 3. Looks curiously, attempts to investigate. PURPOSE: Degree of intelligent response to the strange object. This dog is extremely dominant and has aggressive tendencies. It is quick to bite and is generally considered not good with children or the elderly. When combined with a 1 or 2 in touch sensitivity, will be a difficult dog to train. Not a dog for the inexperienced handler; takes a competent trainer to establish leadership. This dog is dominant and can be provoked to bite. Responds well to firm, consistent, fair handling in an adult household, and is likely to be a loyal pet once it respects its human leader. Often has bouncy, outgoing temperament: may be too active for elderly, and too dominant for small children. This dog accepts human leaders easily. Is best prospect for the average owner, adapts well to new situations and generally good with children and elderly, although it may be inclined to be active. Makes a good obedience prospect and usually has a common sense approach to life. This dog is submissive and will adapt to most households. May be slightly less outgoing and active than a dog scoring mostly 3’s. Gets along well with children in general and trains well. This dog is extremely submissive and needs special handling to build confidence and bring him out of his shell. Does not adapt well to change and confusion and needs a very regular, structured environment. Usually safe around children and bites only when severely stressed. Not a good choice for a beginner since it frightens easily, and takes a long time to get used to new experiences. This dog is independent. He is not affectionate and may dislike petting and cuddling. It is difficult to establish a relationship with him for working or as a pet. Not recommended for children who may force attention on him; he is not a beginner’s dog. a) When combined with 1’s (especially in restraint); the independent dog is likely to bite under stress. This dog may not be feeling well. Perhaps just ate or was recently wormed. Wait two days and re-test. If the test still shows wide variations (lots of 1’s and 5’s), it is probably unpredictable and unlikely to be a good pet or obedience dog. The socially attracted dog is more easily taught to come and is more cuddly and friendly. Its interest in people can be a useful tool in training, despite other scores. The dominant aggressive dog, insensitive to touch, will be a handful to train and extremely difficult for anyone other than an exceptionally competent handler. This is likely to be a “spooky” dog which is never desirable. It requires a great deal of extra work to get a spooky dog adapted to new situations and they generally cannot be depended upon in a crisis. May also be very “spooky” and needs delicate handling to prevent the dog from becoming frightened. Get updates about new Puppies!